Urad Dal Rice - A one-pot meal made with rice, urad dal, garlic and served with sesame seeds chutney. Natural and healthy lunch for kids. 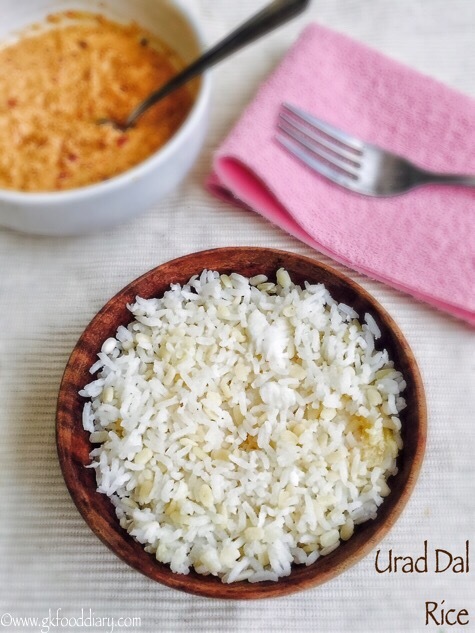 Measure rice and urad dal. Peel garlic and keep it ready along with other ingredients. Wash rice and urad dal together, soak it in water for 10 minutes. Heat a pressure cooker with sesame oil. Add garlic cloves and give a quick stir. Then add soaked urad dal and rice after draining the water. Saute them for 2 minutes. Then add grated coconut. Mix well. Then add the required amount of water and bring it to a boil. Then close the lid of pressure cooker and cook everything in a medium flame for three to four whistles. Once the pressure releases, open the cooker and fluff the rice with a spoon slowly, top with sesame oil if required.